On a concrete or material level, Fehu is linked to wealth or riches in a state of expansion, growth. 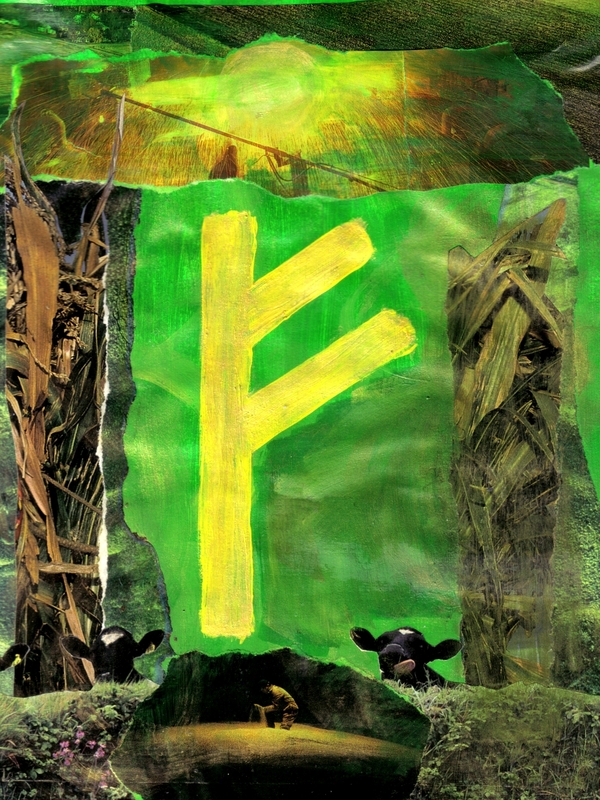 Outside the context of money or currency, Fehu is concerned with resources, the key components for building life, health, and happiness both at the individual and the community level (e.g., rich soil, wind, rain, fruit-bearing trees, livestock, timber for shelter, fibers for clothing, and the who chain of life that begets life). Fehu is often concerned with “the raw materials”, their function, and their value or worth before, during, and after being harnessed by hard working hands. Just as Fehu in a reading or vision can indicate questions of worth related to raw materials, on a psychological level, she can indicate your perception of your own worth. Fehu asks us what we bring to the table and how we can use it toward greater bounty. In a way, Fehu is bright and hopeful, speaking of possibilities as well as practicalities. With Fehu we could also read the value and worth concepts as mundane proxies for the more ethereal notion of potential, that which is coiled within awaiting release via some kinetic process; thereby linking Fehu to production, the process of unlocking the potential contained within raw material. Fehu is a representative of the design, the plan, the beginning when all things are possible, and the initiation of the process/production that will yield something that is hopefully greater than any of the individual raw materials alone. Up to this point I’ve associated Fehu with growth, expansion, and possibilities but related to those concepts is the notion of healthy boundaries and harmonious containment. Fehu is also these things. It is a due pruning to ensure health and growth down the line. Fehu is knowing where and when to cut back to ensure maximum yield…think weeding! Fehu’s might is willing and able to take one step back in order to take three huge leaps forward! With regard to deity alliances, Fehu seems to share affinity with the Vanir in general. Both Fehu and Freyja have investments in potential’s uncoiling, and raw forces coalescing. Also, Freyr is concerned with issues of value, labor, productivity, and worth. Fehu in collaboration with the Vanir can aid with psycho-transformation by helping you to take stock of your potential/raw materials – skills, talents, personality quirks, thoughts, feelings, goals, and aspirations – and in so doing realize your worth, what you have to offer to Self and to Others. This entry was posted in Labyrinth, Runes and tagged Fehu by Wandering Woman. Bookmark the permalink.